Nearly there now… don’t forget to check out the runners up (Parts One and Two), as well as the bands who are ranked from 10 to 6, and 5 to 3. How did Trwbador sneak into the number two slot? They’re just so unassuming. Look at them. They wouldn’t even bruise a fly, let alone hurt one. Well, bluntly, it’s because Sun In Winter has been buzzing around my brain like one of The Numskulls ever since I first marvelled at the breathtakingly clear-cut splicing of folk ‘n’ beatz that makes up this marvel of a song. Now, I understand that mixing folk with snappy, cut-up samples and clicking drums sounds heinous. So it’s the fact that the resulting song is truly wonderful that has propelled Trwbador to such dizzy heights. I’m hoping for – nay, expecting – much more brilliant songsmithery from them in 2012. And I rarely even begin to think things like that. 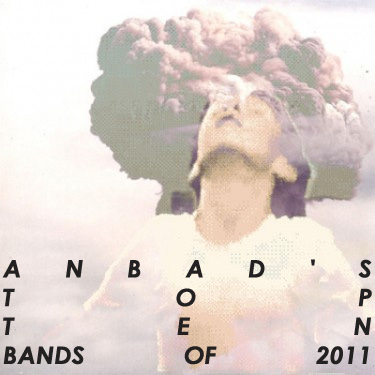 ANBAD said: “Trwbador are not the first band to try to balance this dichotomy. They are one of few who have actually managed it – and how, creating a sound that is otherworldly, yet real; mechanical, yet tender. As we trundle imperceptibly closer to the frothing climax of ANBAD’s 2011 Top Ten, the bands are getting weirder, more coiling, and more devious in nature. Just like capitalism, the closer you get to that top 5%, the more sly and crafty it’s inhibitors are. ANBAD: you’ll come for the bands, but stay for the politics. Don’t forget to check out the runners up (Parts One and, indeed, Two), as well as the bands who are ranked from 10-6. #5 – Tech Coast/Tours: So many bands present themselves anonymously these days, that soon all bands will be faceless, and they’ll have to start changing their name every few weeks to keep us on our toes. Tech Coast have already begun the trend, changing their name to the slightly more generic Tours. Oh well – it doesn’t matter. Tours make wonderful music. ANBAD said: “Eyes to the sky, wrists to the heavens: If a song was ever cloudy, then this is it. Vast, open and – once you crack past the rigidity of the form – softer and more unctuous than egg custard. 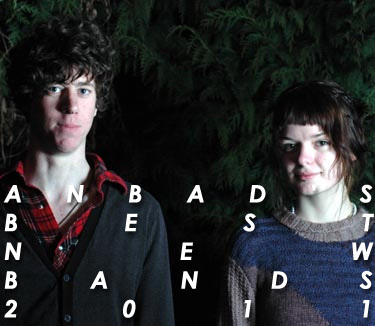 #4 – Baaneex: ANBAD has a fresh-dog-turd-soft spot for bands that are deliberately obtuse. Make of that what you will, but while Baaneex are indeed just that, they are also brilliantly – wait for it – groovy, and unafraid to smash songs to bits part-way through. For all these nods to eccentricity, awkwardness and perversity, they’re a band who deserve to be heard, even before their great songs are taken into consideration. #3 – Tigercats are simply adorable. In the flesh, as, barefoot and shy, they clang at their instruments and sway along to their own melodies; or on record where you’ll want to do the same – they will snag your eyes and ears. Here’s a band who are the equivalent of the beautiful teenage girl who doesn’t realise her own powerful attractiveness yet. Similarly, you’ll want to put a protective arm around them. For now, at least. ANBAD said: “…the genuinely excellent 1985 is steely and brittle beneath its raggedy velveteen exterior. 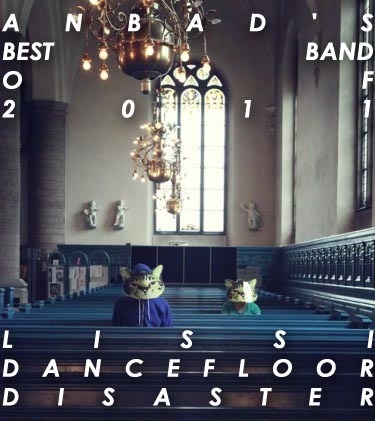 Here’s Part Two of ANBAD’s Best Bands of 2011 Runner’s-Up List. Cast a beady eye over Part One here. Next week, a rarity: decisiveness in action, and I’ll be picking the Top Ten new bands featured on ANBAD this year. All the bands that will be featured over the next week or so have quite definitely not been carefully judged, weighed and balanced against one another: you’ll find no pretence here that this will be anything other than the mysterious blue fluff nestling in the belly button that is ANBAD. So. Why pick the ANBAD End O’ Year List, which starts in earnest next week, over any other music blogs’? Well, there is no real reason, though if you’ve had the determination to read past the first paragraph, maybe you have a modicum of interest in slip-sliding into the grubby, ragged, and frequently ludicrous world of new bands from a slightly different, dubious angle. Where are PRAIRIES from?I can think of some antecedents – for some reason T.V.O.D. springs to mind, apropos of almost nothing – but in all honesty, Prairies may as well be beamed from the future. …Part 2 of ANBAD’s best runners-up arrives tomorrow!